Although a great deal has been published on the economic, social and engineering history of nineteenth-century railways, the work of historical geographers has been much less conspicuous. This overview by David Turnock goes a long way towards restoring the balance. It details every important aspect of the railway’s influence on spatial distribution of economic and social change, providing a full account of the nineteenth-century geography of the British Isles seen in the context of the railway. 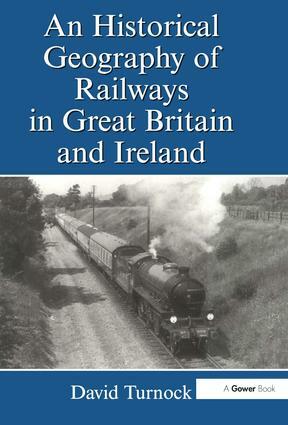 The book reviews and explains the shape of the developing railway network, beginning with the pre-steam railways and connections between existing road and water communications and the new rail lines. The author also discusses the impact of the railways on the patterns of industrial, urban and rural change throughout the century. Throughout, the historical geography of Ireland is treated in equal detail to that of Great Britain. Contents: Introduction: the railway age; Part One: Railway networks: Railways before the age of steam; England and Wales; Scotland and Ireland; Part Two: The Railway impact: Canals and ports; The towns; The countryside; Conclusion; Notes; Select Bibliography; Index.